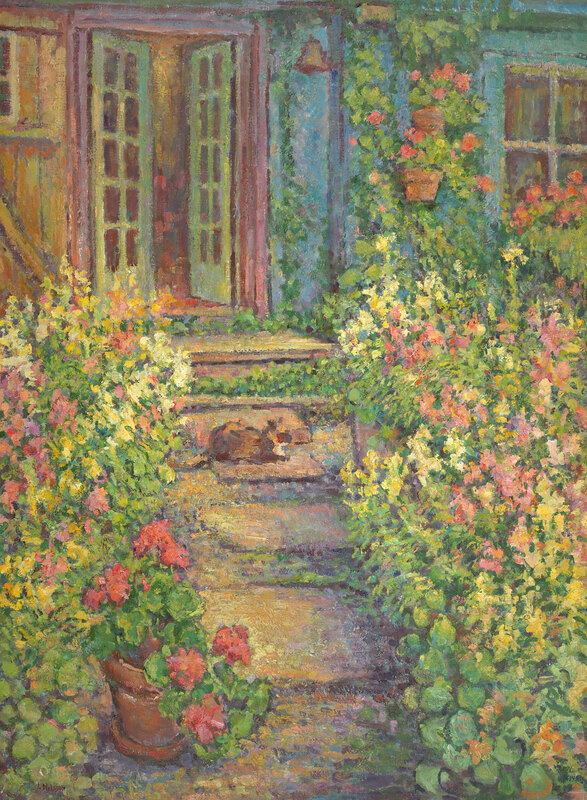 An original oil painting of the path to the artists garden at his Chester studio by Leif Nilsson. This large oil painting measures 54 inches by 40 inches in size unframed and is 59 inches by 45 inches framed. Shown here is the original canvas painted in the summer of 1997 framed in its original frame hand made by the artist, Leif Nilsson. The artwork depicts the path to the artists studio overgrown with a cutting garden full of snapdragons and nasturtiums. The geraniums add a touch of pure chroma red to the overall abundant composition. The artist's cat Calisimo waits patiently for her evening meal.The doors to the studio are slightly open inviting the viewer to enter the studio to see what else may be in there. Notice the ships bell hanging to the upper right of the french doors. When Leif is painting in the garden he often leaves a sign on the door which reads"Please ring the bell" and when someone is brave enough to ring it he comes down from the backyard garden to greet the visitor. This photograph was taken outside of the studio in front of the doors. Click here for more garden paintings by Leif Nilsson. Please scroll down to visit other parts of our gallery.